The high price of transportation fuels, coupled with energy security and environmental concerns, has generated significant investment from government and the private sector in developing and implementing new transportation solutions, best practices and incentives. Alternative fuels and advanced vehicle technologies, with support from government programs, are helping our nation reduce dependence on foreign oil, prevent damage to the environment, and for the first time, provide corporate fleet managers and individuals viable and cost-effective commercial options. 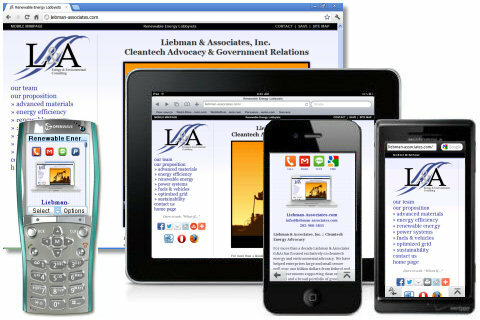 Liebman & Associates (L&A) can help you develop the right partnerships with government and industry to capitalize on the resources and technologies available for your business - right now. Highway vehicles alone account for 55% of total U.S. oil use, more than all U.S. domestic oil production. To address our nation's "addiction to oil," government goals call for reducing U.S. gasoline usage 20% by 2017 and the Renewable Fuel Standard requires 36 billion gallons of annual renewable fuel supply by 2022. While federal and state governments have established a variety of incentives to encourage the widespread development, production and utilization of new fuels and technologies to help meet these targets, federal financial and technical resources are also immediately available to directly assist companies to achieve corporate fleet goals. The Department of Energy ( DOE ), through its National Laboratories and Clean Cities Program, can help fleet operators analyze, select and deploy the right mix of currently available alternative fuels and vehicle technologies; DOE also offers a variety of financial grant and loan programs to facilitate research, development, production, demonstration, and deployment of new ones. Advanced vehicle technologies, such as hybrid-electric vehicles, idle reduction and global positioning systems, and auxiliary power, will enable U.S. citizens and businesses to accomplish their tasks while reducing consumption of gasoline and diesel fuels. Plug-in hybrid electric vehicles (PHEV) can be used to dispatch electricity back to the grid when needed, and models for private and commercial fleets allow engines to be turned off during delivery and service stops while maintaining power for on-board equipment such as hydraulic lifts and HVAC controls. Technology advancements in batteries, power electronics and power trains will help improve the performance of these alternative vehicles to meet the demands of fleets and consumers alike. Unlike other renewable energy sources, biomass can be converted directly into liquid fuels (biofuels) such as ethanol, biogasoline, biobutanol, biodiesel, biojet and renewable diesel. Low-cost feedstocks such as specially grown plants and biomass residues can be used to produce cellulosic ethanol, which has a greater energy balance than corn ethanol and does not compete with food sources. Algae offers the highest land productivity potential for producing biofuels and can sequester the carbon dioxide (CO2) produced by coal-fired power plants co-located with algae farms. Biorefineries convert biomass into fuels much like oil refineries and petrochemical plants do. Renewable energy sources can also be used to make hydrogen that is transported or stored for use where and when needed. Hydrogen can be used in internal combustion engines, but its use in highly efficient fuel-cell-powered vehicles is considered a more important future option. Fuel cells that electrochemically combine hydrogen and oxygen to produce electricity and heat offer the promise of making hydrogen an ideal energy carrier for transportation applications. Ask L&A to show you how your business can benefit from the variety of financial and technical resources available from both the federal government and the private sector, including project funding, expert analysis to make informed decisions, access to new solutions, and assistance with project implementation. Many government programs are offering to offset 50% to 80% of the incremental costs associated with new technology purchases. L&A support reduces project development risk, dramatically improves project return on investment (ROI), and enhances corporate branding and competitiveness.